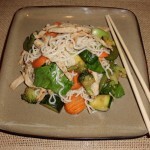 When was the last time you had stir fry "chicken"? Another quick, one pot meal! Sautée chicken strips on medium until lightly browned. They are already cooked but the trick is to give them a slight crust so they don't fall apart too easily. While sautéeing the chicken, prepare the noodles. Rinse them VERY thoroughly in a colander, and shake to remove water. Leave in colander. At the same time, if using frozen veggies, throw into microwave and nuke them. Remove chicken from pan, and if using fresh veggies, sautée them in the same pan. If using frozen veggies, drain water from the bag before tossing into pan. Add chicken back into the pan, and add garlic. Stir briefly, and add noodles. Add ginger, soy, oyster sauce, and sesame oil, a bit at a time, and adjust seasonings to taste. You can always add more! Combine well, take off of the heat, serve, and enjoy! *Vegetarian chicken strips can be found in the frozen section of the supermarket, in the vegetarian section. Some come already flavored (garlic, onion, etc. ), some don't, so keep that in mind when cooking. Tofu Noodles can be found in the produce department, vegetarian section, in good supermarkets.